These iChatAV (Version 2) pages are coloured Green and have the iChat 2 icon on them that was in use at the time, so you know where you are. The icon differs from Version 1 by having the camera logo added. Basically additional information to the info on How to Start a Chat that is specific to A/V Chats. 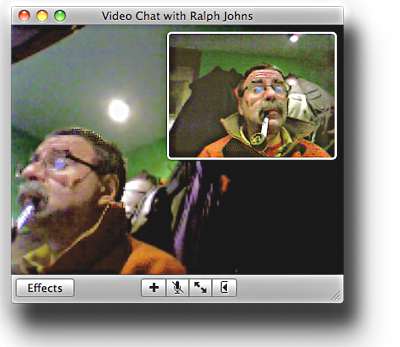 iChat 2 allows you to use a Camera and Microphone to conduct Video or Audio Only Chats. In this context Video chats include Audio as well. The Default camera to use when it first came out was the External iSight that has since been taken off the market. However an USB camera with drivers for your Mac and OS version plus a utility now called iUSBCam can make a USB camera work. There are issues with certain USB 2.0 cameras if you Mac has a USB 2.0 capability that can cause issues about obtaining a Mac Driver for it. I will revisit Exceptions lower down. This menu will display Audio if you only have a Microphone. It will display Video if it sees a suitable camera. 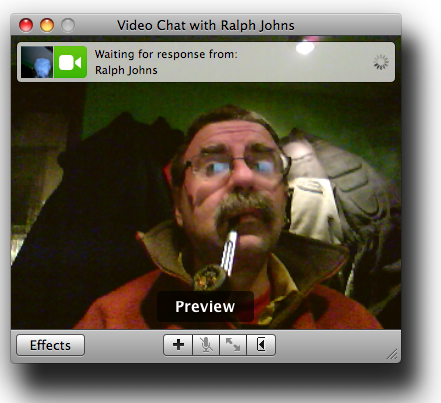 iChat 2 expects the Video camera to be a Firewire camera and the output of that camera to be DV. Both the Enable items need to be selected with a Tick to be "On" (Selecting the items toggle them On of Off). This menu needs the Show Audio Status and Show Video Status to be selected for you to see the relevant Green icons in the Buddy list. If you turn them Off the Buddy List will be shorter as the icons tend to make the line for the individual Buddies deeper but not having them means that starting from the Buddy List then needs you to highlight the Buddy and use the icons at the bottom of the Buddy List (Or start from the Buddies menu). 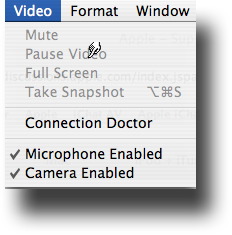 In the iChat Preferences > Video section you get to choose the Microphone in a drop down and an extra drop down will appear if you have two or more cameras. It is the Video section even if you do not have a camera. The Microphone Drop down may well show the Line-in option even if nothing is attached. The Microphone choice here must match the Input device selected in System Preferences > Sound > Input tab. If you have a camera that is Always On like the external iSight one tended to be, then there is an option here to make that start up iChat. It is a useful feature as it will also make you Login to AIM if you lose the Login connection like a auto re-login. You need a suitable Mic. 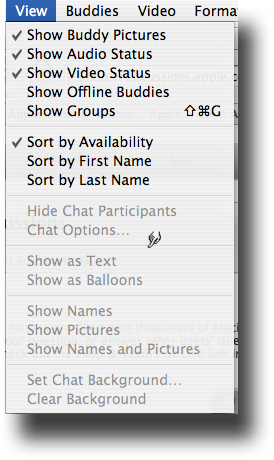 To Have the iChat Preferences and the System Preferences > Sound items to match the Microphone choice. If you have a Second camera to have the camera choice made. By default the Camera input was designed to be the external iSight and this had a DV format. Any other DV Firewire web cam or even a DV Camcorder over Firewire will work with no further drivers. 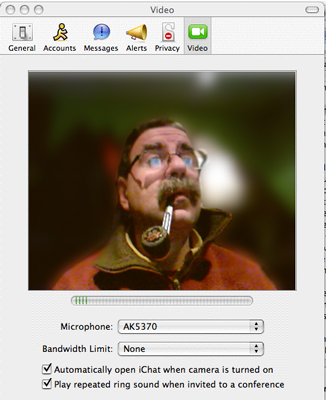 Any USB 1.1 camera can be made to work with iChat. It needs a Mac Driver and the Utility from Ecamm now called iUSBCam (Previously iChatUSBCam). The Ecamm site includes a Camera Guide page with two tables to match current and older cameras to Driver pages. Care should be taken in buying a camera if using iChat 2 as many cameras are now USB 2.0 and these if "Vista Certified" tend not to have specific Mac drivers as the OS at and after 10.4.9 includes a generic USB 2 camera driver for USB Video Class compatible cameras which "Vista Certified" means. (Other cameras may well say USB VIdeo Class (UVC) Compliant as well). This generic USB 2.0 UVC driver is not a driver for USB 1.1 cameras or for those that are not UVC compliant. USB 1.1 needing Mac Specific drivers. USB 2.0 UVC compliant but will only work in OS 10.4.9 and above. If you have a USB 2.0 Card or ports on your Mac as standard then make sure you can get a Mac Driver before buying the camera and paying for the iUSBCam Utility. On the whole go for a USB 1.1 camera where a generic driver from Macam or IOXperts (see links on the Camera Guide page) is more likely. Having said all of that it is reported that people have got USB cameras to work on Macs with specs as low as a G3/450 Mghz Processor. Analogue Camcorders and Stills cameras with a TV or other non DV output can be made to work with a DV Converter. However these are several times the price of a Web Camera and iUSBCam combined but may be an option if you wish to get other Video in to iMovie, for instance, as well. This is much like starting a Text Chat in that you can click on the green icon your Buddy has in the Buddy list. When this is Video Chat you see this from your end with the "Waiting for Response from ..." Message across the top. When they click Accept at their end it will change to "Starting Chat with..."
In turn your Buddy see this Window in the top, middle of his screen floating over other windows, which he can choose to Click to Accept or Deny a Response once he has clicked on it to deal with it. A Successful chat then will then resolve into this Chat WIndow where your Preview shrinks to become the Picture-in-Picture. This particular Chat was over Bonjour between my two Macs so that they are two views of me which is a bit confusing. (this and the following picture are from iChat 4 hence the Effects Buttons. But iChat is consistent with this across all A/V versions). I have also increased the size of the Pic-in-Pic to demonstrate it. In percentage terms it can be as big as this, a quarter of the Picture or as small as a 1/16th I have an extra button on the bottom as I am running an Add-on called Showmacster and this arrow like icon on the right controls the Pop out drawer it has. 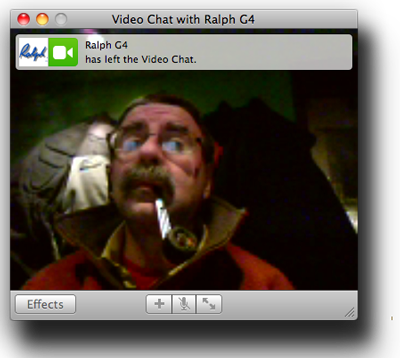 If the Chat fails with an Error message a brief version appears where this pic says "Ralph G4 has left the Video Chat." Longer versions of any Error message appear in the Connection Doctor from the Video (or Audio) menu. In iChat 2 this Error part is not visible in the Connection Doctor as an option it just appears when there has been an Error. What it says can be interpreted with a bit of experience to say what or where the problem lies. As you can see the header line of a following Error is just visible and the area is scrollable. During a successful chat the top part shows your Frame and Bitrates followed by your Buddies and then a graphical representation of the Audio and Video feeds in percentage terms. Most times it will just read 100% and show Green but it can drop off to yellow then red and then nothing if there is a Problem from their end. These are exactly the same except for the moving picture element. You do get to see how Loud you appear when talking though. The Visible part of the Invite appears slightly more right of Center but still at the top of the Screen. The Picture-in-Picture is always in one corner. It can be dragged anywhere within the chat window but when you let go it will go to the nearest corner. Outgoing chat whether Audio only or Video will always place the window wherever you had the Last outgoing chat of that type. Incoming Invites always appear on the same place on the screen and the Chat initially is in the same position so Incoming Video chats are Top Center and Audio Chats are Top Right. Both can be moved to where it is more convenient such as Video chats as close to where the camera is, so that you appear to be looking at it more. This is a somewhat long page on items that are specific to Audio and Video Chats. This looks again at the Menus involved in controlling the camera or Microphone and the exceptions to Cameras that might be needed now External iSights are no longer available. As iChat can remember the position of Windows and this may be of more use to you in holding Video chat I have included the information about that here at the end.